6 March is “World Dentist Day”. Different organization will be observed this day internationally . 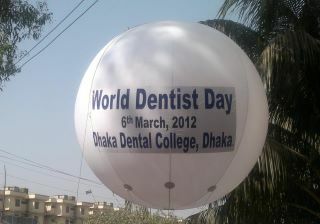 On the occasion of “World Dentist Day-2012” a grand celebration program is going to be organized By Dhaka Dental College & Hospital at 6th March. The program will start at 8:30 am. Honorable State Minister for Health & Family Welfare of Bangladesh graced the program as chief guest . Oral Health foundation will be continue this day at Engineers Auditorium. The Indian Dental Association, Varanasi branch, in association with the Faculty of Dental Sciences, Institute of Medical Sciences, Banaras Hindu University, is going to hold a programme to mark the World Dentist Day (March 6) at the Indian Medical Association building, Lahurabir on Sunday. world dentist day 2013 will also be observed by Shaeed Suhrawardy medical college dental unit.